The battle of Klyastitzy in July 1812 saw the French 2nd Corps being surprised by Wittgenstein's Russian 1st Corps whilst on the way to St Petersburg. The Russians had been withdrawing for weeks but suddenly turned on the French, taking them completely by surprise and even though the Russians were numerically inferior they still managed to block the French advance and carry the day. What tweeks have you made to the firing? One thing I have used is the "Out of ammo" action with a roll of 10 used in the ACW FnF version. But renamed it Exhaustion ( representing fatigue as well as low ammo) so batteries do not fire all day long unless that lucky on the dice. Once pulled they must stay in reserve status for 1/2 die result in turns. The rules does not take affect until after first fire. Players now have to plan for artillery reserve as it should be played! 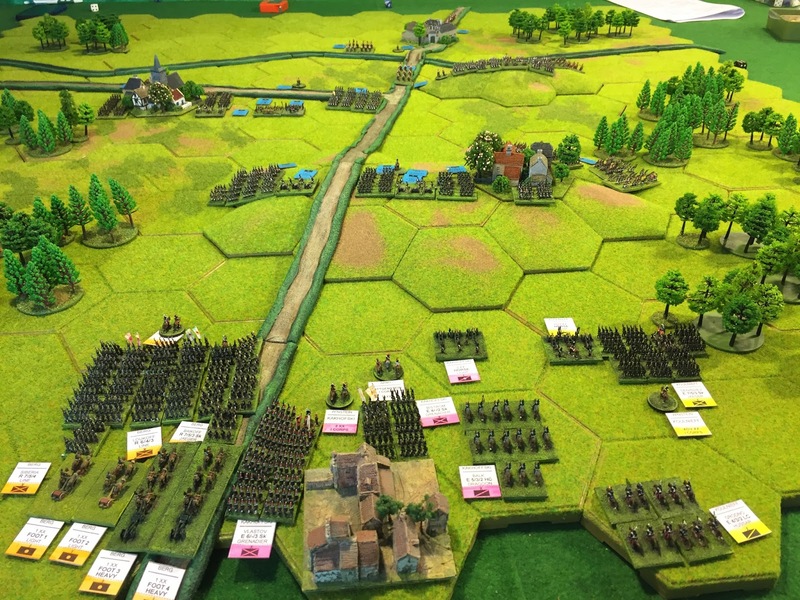 We have been true and loyal to AOE for these last 4 or 5 years without a single modification and have to say that we played several memorable games but certain flaws needed attention which were expected to be addressed with the 2nd edition but it turned out to be a lost opportunity. So it was decided that if we were to tamper we might as well do it drastically. We introduced zone of control,firing by individual not adding all fire points,maneuvre by morale,trading casualties rather than retreating in bua and square ,reactive phase during enemy turn to mention a few. You make some Interesting points on rule mode there – any more details you can share please? It is nice to see people playing some of the lesser known actions of the Napoleonic period. Well done and great pics. David – hope you're keeping well. Please email to Edward Foster as well, if possible using address from our correspondence re your buildings. I'm slowly building up the forces for this scenario, it's taking me years to do. I plan these forces to be organised such I can switch orders of battle swiftly. I'm curious about the unit labels in the pictures. How were they created? I would like to know, soon so I can get drawing my own, assuming I can. I don't have posh drawing software. I'm largely blind as to the size of labels I've built so far but never printed. Ideally needing some sort of background/coloured icons rather than masses of text.